Ocean & Pool View, steps from the Beach! 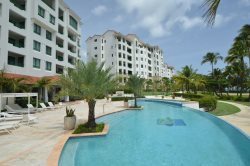 Pamper yourself and enjoy our beautiful beach front condo located in the exclusive gated community of Marbella Club, Palmas del Mar Resort. The condo has direct access to the pools and beach. It has a beautiful fully equipped kitchen, living room, dining room, a balcony/terrace to enjoy the nice ocean breeze, 2 bedrooms suites (1 king and 1 bunk bed with two twin beds and a double bed), and 2.5 bathrooms. The exclusive community of Marbella is surrounded by beautiful landscapings, fun pools for adults and kids, heated jacuzzi, a recreational gazebo area, and a BBQ area. There is also a fitness center and full concierge services. Our guests receive Resort Guests Passes which offer discounted rates at the Tennis and Golf Club, plus the use of the Beach Club from Monday-Friday (excluding holidays) at the published rates.